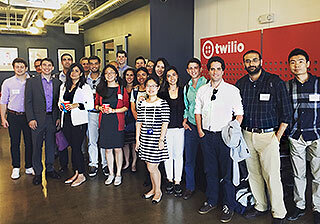 JD/LLMLE students participating in the summer entrepreneurship immersion program with students from Duke's Pratt School of Engineering. When Dyna Zekaoui ’16 began her 2L summer job at Linklaters in London, she quickly realized that she had an edge. It was not just that her pursuit of an LLM in Law & Entrepreneurship along with her Duke JD gave her early exposure to business law classes and hands-on experience working in a start-up company. She also already had a grasp of terminology and techniques used in valuing and financing companies, which she learned in Advising the Entrepreneurial Client with Clinical Professor Erika Buell, and how capital markets work, thanks to Securities Regulation with James Cox, the Brainerd Currie Professor of Law. Both are required classes for the dual degree. “I really think the JD/LLMLE program gave me an amazing head start,” said Zekaoui, who graduated in May and re-joined Linklaters in September. Zekaoui was a member of the first class of Duke Law students to earn the JD/LLMLE. By the time they graduated in May, all had secured employment at major global law firms. The success of the JD/LLMLE graduates in the job market capped a strong year of hiring for Duke Law graduates overall. As of March 15, 93 percent of students in Duke Law’s Class of 2015 were employed in long-term, full-time positions that required passage of the bar exam or were “JD preferred.” Duke ranked fourth among all U.S. law schools on that measure, according to an analysis by The National Law Journal. Sixty-seven percent of 2015 graduates were working for law firms with at least 101 attorneys, and 15 percent were serving in judicial clerkships. A total of 67 Duke Law graduates clerked during the 2015-16 term, the equivalent of almost one-third of a typical graduating class. Duke Law established the JD/LLMLE dual-degree program in 2013 to prepare students to advise, create, and lead entrepreneurial ventures. Students complete requirements for both degrees in three years of study plus a start-up immersion experience during the first half of the summer following their first year. JD/LLMLE students can elect to participate in a practicum with a start-up company, receive preferred placement in Duke Law’s Start-Up Ventures Clinic, which counsels early-stage companies, and have access to special networking functions in the thriving Research Triangle Park entrepreneurial community. The focus of the program also appealed to Steven Wright ’16 when he was applying to law school. Wright had considered combining a JD and an MBA, which typically takes four years of study, but the JD/LLMLE provided “a good complement” to his undergraduate business training without the additional year of school, he said. By the time he and his classmates began interviewing after their 1L year for 2L summer associate positions, they had a grounding in the mindset of the entrepreneur through their coursework, which included taking Business Associations in their first year rather than waiting until their second, frequent interactions with successful entrepreneurs, and the hands-on experience gained during their immersions. During his immersion, Wright helped a Durham company developing an online marketplace for day care with legal research and marketing projects. Trevor Kiviat ’16 believes his JD/LLMLE experience led to his success in on-campus interviewing. In particular, it gave him the opportunity to connect his legal ambitions with his prior experiences – starting a web consulting company in college and a charter school while participating in Teach for America. He fielded multiple offers in law and consulting, ultimately spending his summer at Davis Polk & Wardwell in New York, which he is joining in October as an associate rotating between two of the firm’s corporate groups. Employers have begun to take note of the unique benefits of the program. Lila Hope ’02, a partner at Cooley LLP in Silicon Valley, said that it provides a signal to employers that a student has a plan for her legal education and is taking ownership of her career development early in law school. It also demonstrates that a student has a strong interest in serving entrepreneurial clients. Cooley, a Silicon Valley mainstay that has advised Google, Facebook, and eBay, has recently hired two Duke Law JD/LLMLEs for its Palo Alto, Calif. office: Rose McKinley ’17, who will join the firm as an associate after graduating, and Alex Lawrence ’18, who will spend his 2L summer there.